"No way this is a Tuesday night in D.C.," I said over the pulsing music and roar of happy diners at the newly opened Daikaya Izakaya (705 6th St. NW) in Chinatown. The restaurant was bustling for a weekday and judging by the ever-growing line for tables, it would remain so well beyond the late time I left the restaurant. But the wait is well worth the effort at what is now one of my favorite restaurants in the District. From the kitschy-cute menu stapled to a Japanese pop magazine, to the Japanese commercials running in the bathroom, to the cozy seating arrangements, Daikaya feels like home the moment you walk in and the food invites you to stay. We basically tasted the entire menu, thanks to the very tapas-style (sorry, Japan, for the analogy to Spain) plating. Everything arrived quickly as a result of the mobile ordering devices carried by each server so the request is basically instantaneous. I loved the freshness of the "cold dishes" menu category, particularly the cucumber salad made with rayu, garlic chips, ground sesame seed and chili thread ($6). A whole cucumber was lightly serrated and laid on the bed of sauce, arrayed with the additional garnishments. I felt sated eating it but was left wanting more, which is a good sensation to have from a first course. Another good one is the yamaimo (tiny slivered potatoes) with sweet soy vinegar, basil and marinated salmon roe ($6). Much like the cucumber, it was very fresh but with a thicker texture so it stays with you a bit longer. If you had to choose an accompaniment for the cucumber salad, I would recommend the mizuna salad with burrata, tomatoes and dashi gelee ($12). The mixed green salad surrounded a nice amount of cheese, and the tomatoes and gelee added just the right mix of tang and sweetness. From the "fried dishes" category, you must try the crab croquettes ($8). Two crab balls are presented with their flavoring of Old Bay, tonkatsu sauce and nori salt, and the crab croquettes melt in your mouth, bursting with flavor. If you're in the mood for meat, any of the skewered items are very good, but I would not miss the fried garlic ($3) in the "unique dishes" category. You'd think the garlic would be pungent and overwhelming, but it was fried to a mushy texture and rendered nearly tasteless, so the pairing with the spicier and brighter kimchee miso made for a perfect combination. The drinks and desserts were also top-notch. The cocktails were not too sweet, and you won't want to skip the chocolate ice cream with miso-banana caramel, chocolate crisps and crushed banana chips ($4). Two generous scoops. Downstairs you'll find the noodle bar; however, you should really climb the stairs to the Izakaya and try several of these wonderful dishes. 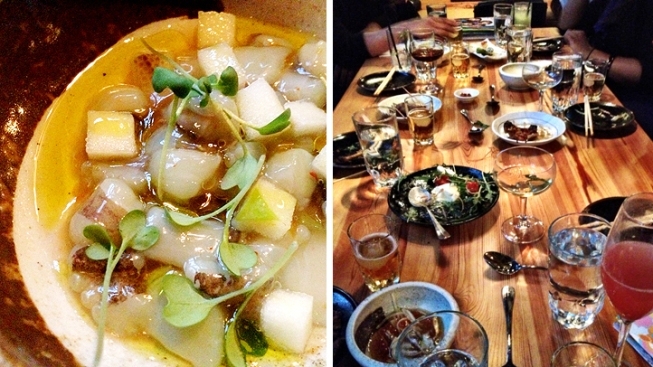 Many kudos to Daikaya for bringing something so fun and tasty to D.C.